Lapis Lazuli is a gemstone compared to stars in the sky. Stone’s names: Lapis Lazuli, Lazurite. Color: Lapis Lazuli occurs in various shades of blue with some qualities being speckled with white calcite and some with yellow pyrite. The finest Lapis Lazuli is even blue color with little or no veining from other elements. Description: Lapis lazuli is a semiprecious stone valued for its deep blue color. 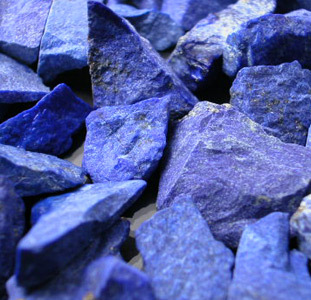 The source of the pigment ultramarine, Lapis lazuli is not a mineral but a rock colored by lazurite. The name’s origin: The name lapis comes from word pencil in Spanish. 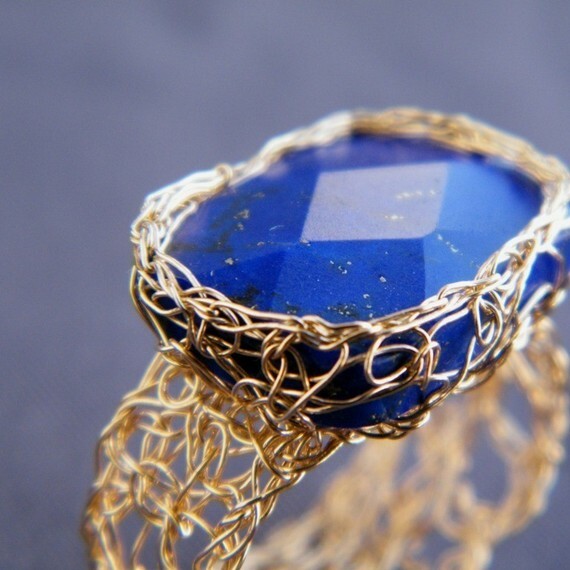 Wedding anniversary: Lapis Lazuli is the anniversary gemstone for the 7th and 9th year of marriage. Care and treatment: Lapis Lazuli can easily be scratched or chipped. From the stone history: Lapis Lazuli with deep azure blue color, often flecked with golden pyrite inclusions, was treasured by ancient Babylonian and Egyptian civilizations and often worn by royalty. Lapis lazuli was widely used by Egyptians for cosmetics and painting . Persian legend says that the heavens owed their blue color to a massive slab of Lapis upon which the earth rested. 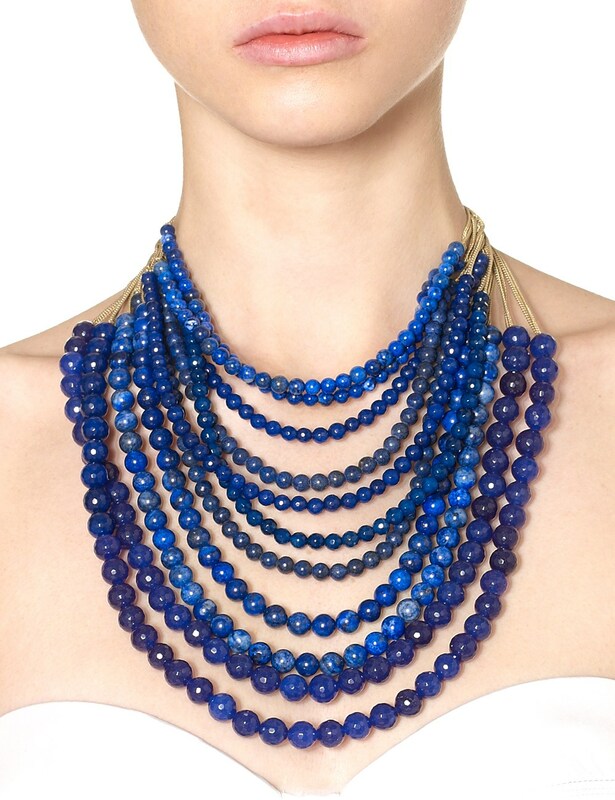 Lapis Lazuli was believed to be a sacred stone, buried with the dead to protect and guide them in the afterlife. Lapis lazili is one of the gemstones, that used in commesso, also called florentine mosaic. Commesso is a technique of fashioning pictures with thin, cut-to-shape pieces of brightly colored, semiprecious stones, developed in Florence in the late 16th century. But it has also been used to make the beautiful blue paint ultramarine and has been used as a source of writing instruments. Ultramarine is used in paints, lacquers, and decorating materials. It has a particularly brilliant blue color and is very lightfast. Lapis-lazuli, also called lapis or lazurite, is not normal type of gemstone. It is not pure like a diamond, ruby or sapphire. Lapis-lazuli is a compound consisting of various minerals, such as augite, calcite, diopside, mica, haüynite, hornblende and pyrite, just to name a few. The stone’s coloration varies from dark blue to a lighter shade of blue. Because of the shuffle of ingredients found within Lapis-lazuli sometimes green coloration comes out and very rarely will a lapis-lazuli stone be completely green. Because of the pyrite, fool’s gold, lapis-lazuli looks like the night sky, with the specks of gold relating to the stars. The color of the stone is very opaque, only really thin cut sections of the stone are translucent. Because of this opaqueness, lapis-lazuli is cut differently than other stones. Diamonds are cut with many facets because of their brilliance. This allows the light to be caught and bounce around inside the stone before exiting. This doesn’t happen with lapis-lazuli. It is rare for a lapis-lazuli to be cut with facets as they won’t be seen very well, and won’t create a brilliant effect like with the diamond. 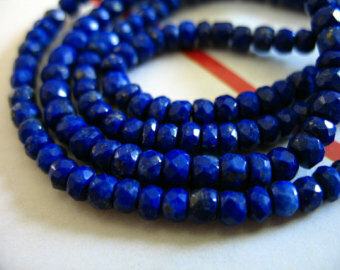 Instead, Lapis-lazuli are cut on either curves or planes, meaning beads or flat and round, like a good skipping stone. However, lapis-lazuli can be used for carving, as a lapis-lazuli buddha statuette has been found in Afghanistan. Lapis-lazuli is a rare stone, with only three main veins around the world. One of the oldest is found near the source of the Amu-Darja river in the Badakshan region of Afghanistan. The mining process in that vein is very similar to how it was thousands of years ago. Another strong vein is found on the western end of Lake Baikal in Siberia. It is also found in three nearby rivers, the Talaya, Malaya Bistraya and Sludianka. However, these deposits in Russia are considered to be of lower quality to those in Afghanistan. The Siberian lapis-lazuli tends to have less flakes of pyrite, and also a red/violet core. The last major vein, considered to be of even lower quality than the vein near Lake Baikal is the one found in the Chilean Andes Mountains. The vein is located near the sources of the Cazadores and Vias rivers, two small tributaries of the Rio Grande. Here the stone appears in beds of white and grey limestone. The lapis-lazuli found in Chile usually has a greener tint than other sources, and the stones are often marred by the strong presence of calcite, creating white patches in the stone. The Chilean lapis-lazuli also has a lighter color than its asiatic brethren. Lapis-lazuli has also been found at Mount Summa, the crater of mount Vesuvius, as well as the island of Burma.